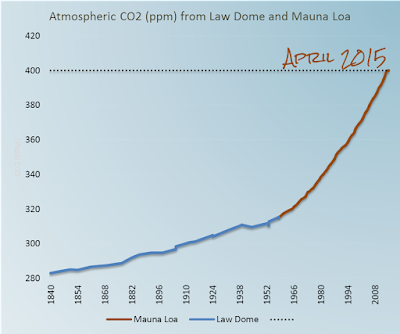 CO2 is at 400 ppm and rising - and Bob Tisdale thinks we can reduce it easily! As I wrote last time, this has never happened before since humans evolved. It's never happened in at least 800,000 years and probably much longer. 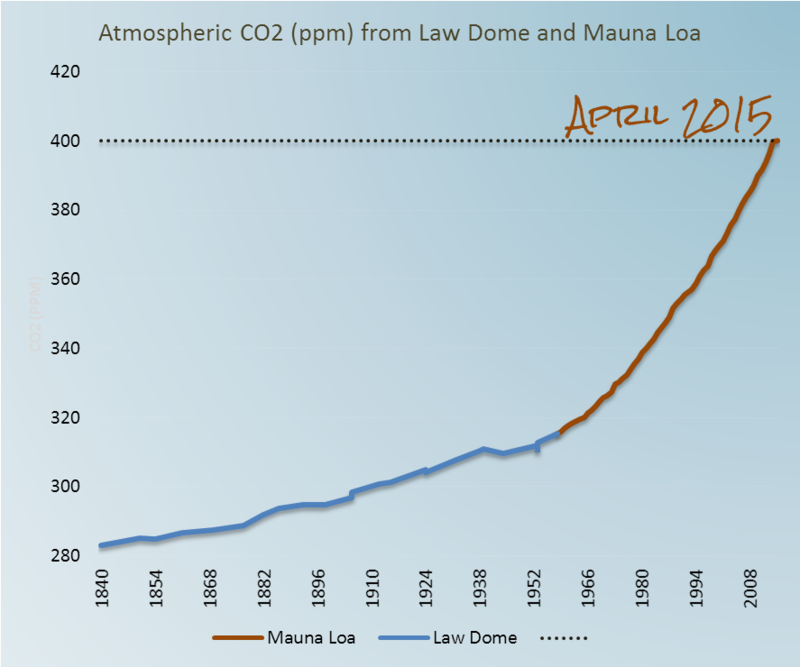 How long before we double CO2? If we keep going as we are, we'd probably hit it in the next 30 or 40 years. This will bring a rise in average global temperature of four to six degrees above pre-industrial before the end of the century - and then more. 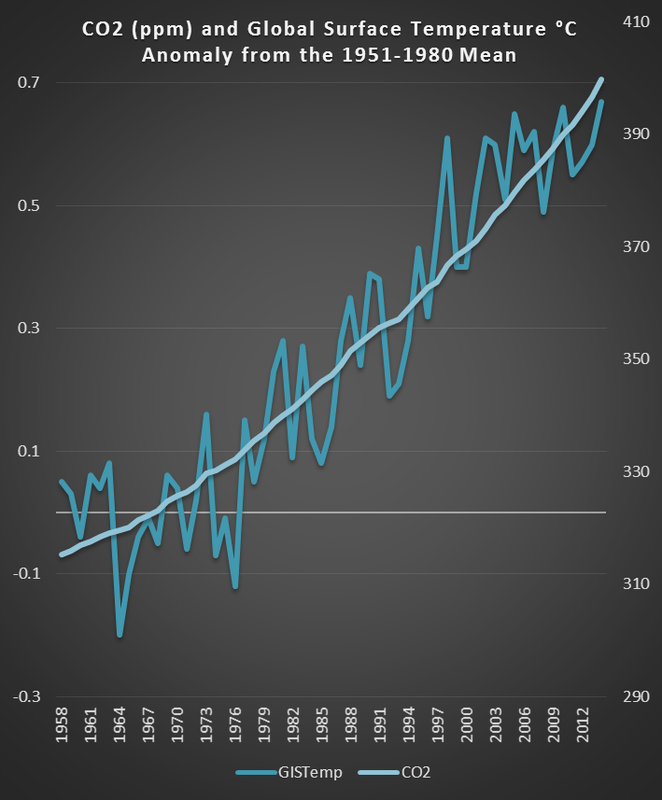 James Butler, director of NOAA’s Global Monitoring Division, added that it would be difficult to reverse the increases of greenhouse gases which are driving increased atmospheric temperatures. “Elimination of about 80 percent of fossil fuel emissions would essentially stop the rise in carbon dioxide in the atmosphere, but concentrations of carbon dioxide would not start decreasing until even further reductions are made and then it would only do so slowly." “…difficult to reverse…”? I’ll let you comment on that. Is Bob advocating massive geo-engineering? That would be a generous interpretation. I don't buy it. I think he really does not understand that once CO2 gets into the air it takes a very long time before it's removed. It shows that he's never bothered to read up on the carbon cycle. For someone who pretends to be an expert in climate, Perennially Puzzled Bob Tisdale does a good job of faking complete ignorance (as always). What it demonstrates is that he's never in his life studied general science. Bob's article brought out the most utter of the utter nutters at WUWT. Not only were there lots of people celebrating this unfolding disaster, there was the usual crowd of the illiterati who couldn't wait to show off their science denial. I imagine these same people party when they hear of other people suffering drought, wildfires and floods. They think such things are something to chuckle over - as long as it's happening to someone else. Time to crack open a beer! My garden is very happy to hear this news. Or: Global carbon dioxide concentrations surpass 0.0004 for the first month since measurements began. Or: If the atmosphere was made up of oranges and CO2 was an apple then for every 2,500 oranges you would find 1 apple. It takes 18 oranges to make 1 carton of a well known brand of orange juice, hence you’d have to buy 139 cartons on average to get yourself the juice of 1 apple. But that 1/18th of a carton will cause the other 138 cartons to heat up to catastrophic temperatures. Alan the Brit doesn't know that for every CO2 molecule we create by burning fossil fuel, we eliminate two molecules of oxygen from the air - we don't create more. Don’t forget that it’s CO2, = 1 x C atom + 2 x O atoms, so we’re effectively enriching the oxygen content of the atmosphere too! This is how it will end I think – as the climate worriers become ever more detached from reality, their lunacy will become irrefutably obvious. When it reaches 800ppm the global temperature will rise by 1.1C according to some estimates. At 2ppm per year increase (which incidentally does not depend linearly on anthropogenic CO2), this should take about 200 years. It’s going to be a long time before they grow grapes in Siberia. Climates are changing much faster than Walt knows. Someone tell him that not only are wine grapes now being grown in Siberia, they are now being grown in Finland, Sweden and Norway, too. Humans emit about 4.5 ppmv/year. The atmosphere increases with about 2.3 ppmv/year. Net sinks are around 2.2 ppmv/year. Thus if we lower human emissions to 2.2 ppmv/year, there is a break-even between human emissions and sink rate. The net sink of 2.2 ppmv/year is largely the flux difference between the atmosphere and the ocean. It is a function of the partial pressure difference at the interface so the net sink will not be a constant 2.2 ppmv/year if human emissions change significantly. I can’t say for certain that NOAA has done the calculation correctly, but your simple argument is not correct. Allencic likes to fart in windstorms. I still think the best way to express CO2 concentration to the average Joe is to say that it’s 4 molecules of carbon dioxide for every 10,000 molecules of nitrogen, oxygen, argon and other trace gases. Big deal, we’ve gone from around 3 to 4 and only about 3% of that increase is caused by man. In other words, with no temperature rise of significance this invalidates the theory that increased CO2 means drastic warming. Ain’t happening. Just a fart in a windstorm. I posted this on the Guardian earlier today. 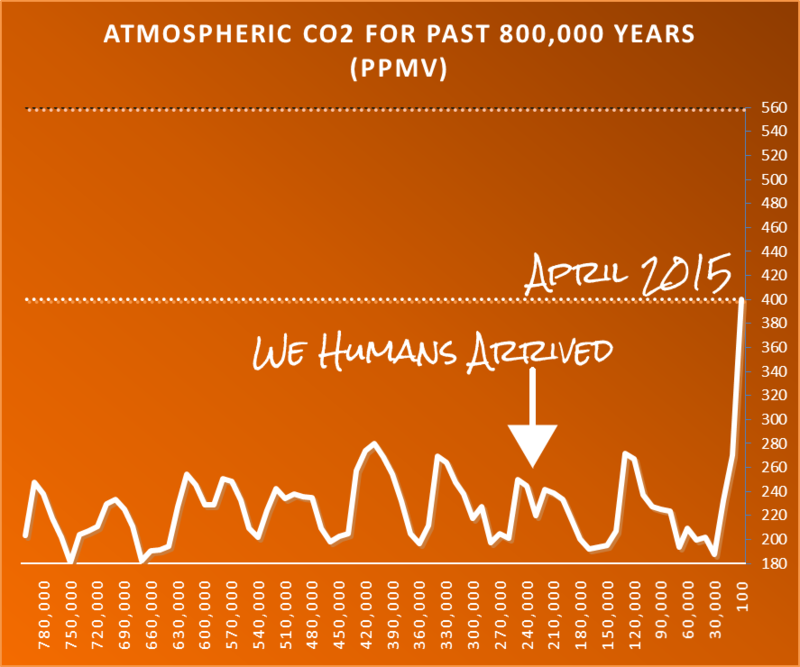 “So CO2 concentration keeps rising and temperatures do not. Further evidence that climate sensitivity to CO2 is very low. As we sceptics have been arguing. But it’s now been deleted (even from my comment history). The Cult of CAGW needs a back-up plan. Planetary temperature has started to fall. The drop in planetary temperature is very soon going to appear as if the warming switch has been turned off. The mechanisms which were inhibiting the solar cycle modulation of planetary cloud cover have started to abate. While the inhibiting mechanisms were doing their thing, solar activity has dropping year by year, so when the inhibiting mechanism abate, bingo, the planet cools significantly due to increased cloud cover. Is WUWT attracting more and more nutters? The final stomping ground of the illiterati. I don't think there was a single comment from anyone who has a serious interest in climate science. Or even anyone with a passing interest. I don't think there was a single thoughtful "thought". Why would any sane person bother. Etheridge, D. M., L. P. Steele, R. L. Langenfelds, R. J. Francey, J. M. Barnola, and V. I. Morgan. "Historical CO2 records from the Law Dome DE08, DE08-2, and DSS ice cores." 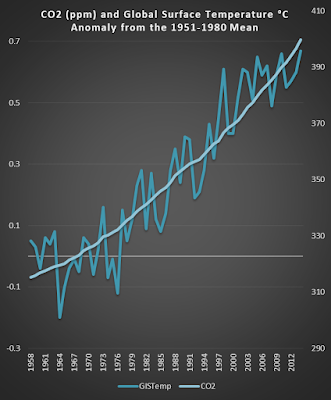 Trends: a compendium of data on global change (1998): 351-364. Link. Alan the Brit's comment is hilariously wrong. They keep getting dumber and nuttier every day at WUWT. Strange that Bob Tisdale cannot be bothered to look at Wikipedia before making a fool of himself. Once we stop emitting the reductions in CO2 will be very slow, it will take many centuries until the concentration is somewhat back to normal. If the atmosphere was made up of oranges and CO2 was an apple then for every 2,500 oranges you would find 1 apple. Everyone who thinks this only a little bit should think of poison or watch this highly recommended video visualising the concentration with ink. Folk who are preoccupied with the proportion of apples and oranges in the atmosphere should consider the effect of one radiatively-opaque gas compared with another*. 400 ppm or 0.3 ppm, apparently 'low' concentrations can have profound atmospheric (and biological) effects. Anyone who says otherwise is an idiot, an ignoramus, and/or an ideologue. on CO2, it now appears that Judith Curry has gone full denial on the anthropogenic nature of the rise. ...I am not convinced by simple mass balance attribution arguments based on current observations. 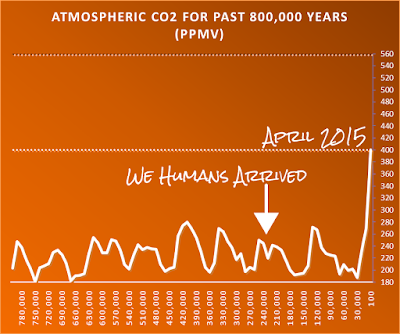 I think it unlikely that 100% of the increase in atm CO2 is caused by humans. It is not unreasonable to start from a point of 50-50 (Fred’s conclusion) and see if you can falsify natural variability as large as 50%. It may not be 50%, but I don’t think it is 0%. CO2 has been between c 180ppm and 280ppm for a million years through several ice age cycles, and suddenly rose to c 400ppm commensurate with industrialisation, during which time we have emitted about double the CO2 necessary to cause such a rise. How is it possible to view JCs statement as anything other than denying proven facts?